Winemaker’s Notes: Cherry red robe. Fresh red fruit and floral aromas with toasted and earthy notes. Fresh mouthfeel, balanced acidity, and elegant, velvety tannins. Marries to perfection with tuna tartare or a fresh salad. My Review: It wasn’t that long ago that I didn’t realize how much Pinot Noir was made in South America and in Chile in particular. I’ve enjoyed wines made with the grape for a while thanks to the wide range of wine that is made with the grape, with each region putting their own spin (as it should be). 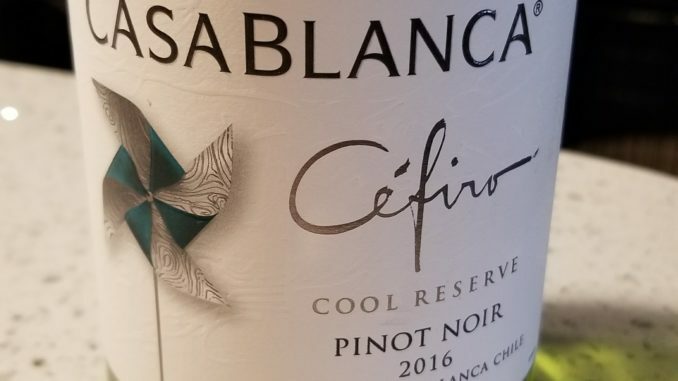 So I was more than happy to open up the 2016 Vina Casablanca Cefiro Reserva Pinot Noir to see what I thought of it. In the glass the wine was a bit darker than what you may see from some west coast pinots – light still shone through when held up to a lamp, but it was more muted than what I’ve seen from some Oregon pinot. On the nose I picked up notes of red fruit and lavender. In the mouth the wine was light to medium bodied, with flavors of cherry and cola leading into soft earth notes and a soft, slightly tannic finish. I liked this wine a lot, especially for the price point, as I think it’s a versatile food wine – it has enough body to stand up to some of your meatier dishes, while still being delicate enough to pair with lighter seafood dishes. Any red that can do that for under $20 is one to keep an eye on.